Reference number for this case: 3-Oct-54-Landerneau. Thank you for including this reference number in any correspondence with me regarding this case. Case summary: A PHOTOGRAPH OF A FLYING SAUCER? "last Sunday, as I was with a friend in the countryside, I was on the point of taking a panoramic photograph when our attention was caught by a light whistling sound and, looking in the direction of the noise, we saw an indefinable machine, emitting orange gleams, in the sky. Directing my camera, I had the chance to grab it in my objective at the time when it seemed to carry out a turn. But before I could take another photograph, the mysterious machine had disappeared in the direction of the south. Being given the rumours which circulate on the flying saucers and the mystifications which seem to take place, we hesitated to address the photograph to you and we primarily wish to remain anonymous so as not to be the subject of interviews. We do not want in any case to deprive us of the photographic film, because this image taken on the moment remains an imperishable memory to us". Note of the newspaper staff. - We deliver the text and photograph to the curiosity of our readers. Will the "country of the moon" become the country of the saucers? Luc Chastan indicates that in the Finistère in Landerneau on October 3, 1954 at an unknown hour, the witness, being with a friend in the countryside, was on the point of taking a panoramic photograph when his attention was drawn by a light whistling sound and, looking in the direction of the noise, they see in the sky an indefinable machine, emitting orange gleams. Pointing his camera, he had the chance to get it in his objective at the time when it seemed to carry out a turn. But before he can take another photograph, the mysterious machine had disappeared in the direction of the south. The photo was sent to a newspaper under anonymity. Luc Chastan indicates my website ufologie.net as being the source. Testimony nr. 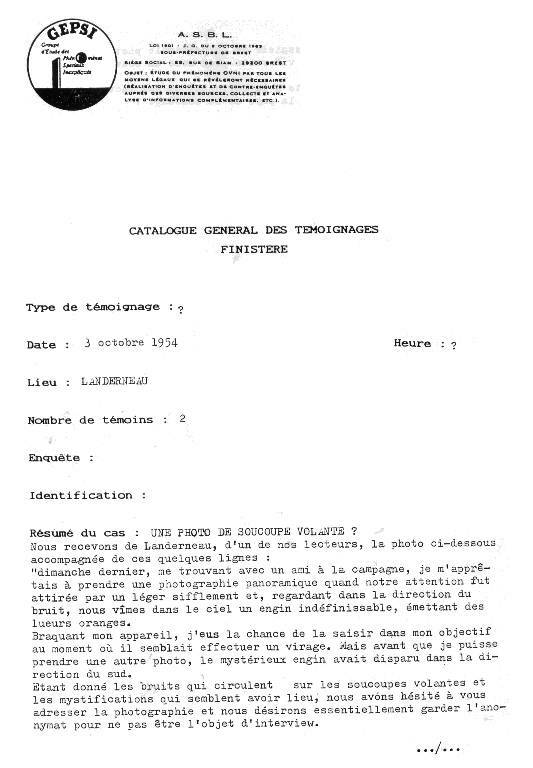 FR 29 800 1954 10 03 .. ..
[ge1] File record, GEPSI ufology group, the Finistère, France.